HomeUncategorizedAre you in a relationship with a narcissist? June 6, 2014 Comments Off on Are you in a relationship with a narcissist? It is not that narcissists are incapable of expressing what we would tend to classify as “extreme emotional reactions”. They mourn and grieve, rage and smile, excessively “love” and “care”. But this is precisely what sets them apart: this rapid movement from one emotional extreme to another and the fact that they never occupy the emotional middle ground. The narcissist is especially “emotional” when weaned off his drug of Narcissistic Supply. Breaking a habit is always difficult – especially one that defines (and generates) oneself. Getting rid of an addiction is doubly taxing. The narcissist misidentifies these crises with an emotional depth and his self-conviction is so immense, that he mostly succeeds to delude his environment, as well. But a narcissistic crisis (losing a Source of Narcissistic Supply, obtaining an alternative one, moving from one Narcissistic Pathological Space to another) – must never be confused with the real thing, which the narcissist never experiences: emotions. Many narcissists have “emotional resonance tables”. They use words as others use algebraic signs: with meticulousness, with caution, with the precision of the artisan. They sculpt in words the fine tuned reverberations of pain and love and fear. It is the mathematics of emotional grammar, the geometry of the syntax of passions. Devoid of all emotions, narcissists closely monitor people’s reactions and adjust their verbal choices accordingly, until their vocabulary resembles that of their listeners. This is as close as narcissists get to empathy. This opens a gap – rather, an abyss – between the narcissist and other humans. Because he considers himself so special and so superior, he has no way of knowing how it is to be human, neither the inclination to explore it. In other words, the narcissist cannot and will not empathise. Can you empathise with an ant? Empathy implies identity or equality with the empathized, both abhorrent to the narcissist. And being perceived by the narcissist to be so inferior, people are reduced to cartoonish, two-dimensional representations of functions. They become instrumental, or useful, or functional, or entertaining, gratifying or infuriating, frustrating or accommodating objects – rather than loving or emotionally responsive. It leads to ruthlessness and exploitativeness. Narcissists are not “evil” – actually, the narcissist considers himself to be a good person. 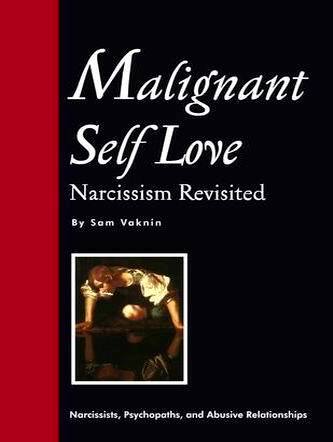 Many narcissists help people, professionally, or voluntarily. But narcissists are indifferent. They couldn’t care less. They help people because it is a way to secure attention, gratitude, adulation and admiration. And because it is the fastest and surest way to get rid of them and their incessant nagging. The narcissist may realise these unpleasant truths cognitively – but there is no corresponding emotional reaction (emotional correlate) to this realisation. There is no resonance. It is like reading a boring users’ manual pertaining to a computer you do not even own. There is no insight, no assimilation of these truths. Still, to further insulate himself from the improbable possibility of confronting the gulf between reality and grandiose fantasy (the Grandiosity Gap) – the narcissist comes up with the most elaborate mental structure, replete with mechanisms, levers, switches and flickering alarm lights. Narcissism Isolates the narcissist from the pain of facing reality and allows him to inhabit the fantasyland of ideal perfection and brilliance. Narcissism comes in sub-clinically significant forms as well by the way — those individuals, we all know. Some studies have suggested that it is nearly impossible to achieve positions of great power and influence without a little of such. In so many other ways, life with such a person may be profoundly compelling — while also being terrifically lonely and painful. For her next manipulation, Hepper and her co-authors asked a group of 95 female undergrads to take the same narcissism quiz, and then later to watch a 10-minute documentary about Susan, a victim of spousal abuse. Half were told to try to put themselves in Susan’s shoes (“Imagine how Susan feels. Try to take her perspective in the video…�? ), while the others were told to imagine they were watching the program on TV one evening. “I think what’s going on here is that people who are low on narcissism are already responding to people—telling them what to do isn’t going to increase their empathy any further,�? Hepper said. “But the higher on narcissism you get, the less empathy [you feel]. By instructing them to think about it, it activates this empathic response that was previously much weaker.�? And the narcissists weren’t just faking it. In a third experiment, Hepper showed that extreme narcissists had lower-than-average heart rates when listening to a recording of a woman in distress. (That is, “Their lack of empathy is more than skin-deep,�? Hepper writes.) But if they were told to take the woman’s perspective, their heart rates leapt back up to a normal level. In the intervening time, instead of hating and raging at the narcissist (Which just leaves them confused and victimized anyway), it may be easier to start thinking of his or her empathy struggles as being a disability more like physical blindness — and compassion training to be more like the required white cane.